According to the NHTSA, during daylight hours, approximately 481,000 passenger vehicles are driven by people using handheld cell phones. * That is a huge potential for fatalities and serious, life-threatening injuries on our Kansas City roads. This catchy tagline, once part of a campaign to raise awareness of the dangers of distracted driving, really says it all. Texting is a deadly form of distracted driving because text messaging requires visual, manual, and cognitive attention from the driver. Texting takes a driver’s attention away from driving more frequently and for longer periods than other distractions. 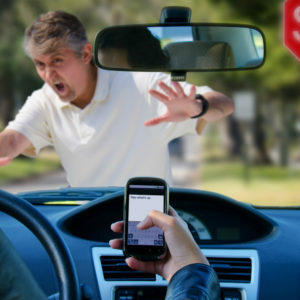 A 2017 study published by the AAA Foundation for Traffic Safety found that 87.5% of drivers perceive distracted drivers as a bigger problem today than in past years. In 2015 alone, 3,477 people were killed, and 391,000 were injured in motor vehicle crashes involving distracted drivers. 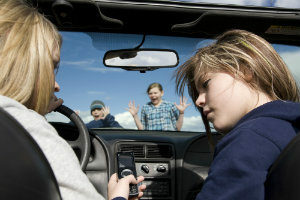 Distracted driving, especially texting and driving, is a significant driving danger. Texting while driving has been completely banned in all but three of the 50 states and another 16 also prohibit talking on a cell phone without a hands-free device. Even though only drivers under 21 in the state of Missouri are prohibited from texting while driving, it does not mean you can’t seek compensation for injuries incurred in a texting and driving accident. If you suspect the other driver was texting while driving, obtain the advice of a personal injury attorney, one familiar with accidents involving texting and driving. In the Kansas City area, the experienced auto accident attorneys at Nash & Franciskato are knowledgeable and well versed in investigating these types of car accidents. We take the burden off your shoulders so that you can concentrate on what matters most, healing and recovering from the accident. Our car accident attorneys will conduct a thorough investigation of the accident, finding out all of the details, and talking to witnesses. In addition, we will subpoena phone records to confirm or deny if the driver was talking or texting when the accident occurred. If you have been injured by a distracted driver, one who has been texting and driving, let the attorneys at Nash & Franciskato help you obtain the compensation you deserve. In the Kansas City area and across Missouri, the Nash & Franciskato Law Firm will fight for your rights. Contact us today for a free, no-obligation evaluation of your case.